Welp, this one's never not hard to watch. 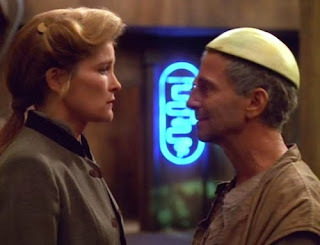 Resistance is a fairly non-traditional episode in that it takes place almost entirely off-Voyager and almost entirely with one cast member--Janeway. While Tuvok and B'Elanna are featured in the B-plot and the rest of the crew are briefly visible trying to retrieve the aforementioned characters, Janeway and this week's Delta Quadrant Guest, Caylem (played by Joel Gray), are more than capable of carrying this one all the way through. It begins with Janeway, Tuvok, Neelix and B'Elanna down on a planet where they're buying some much needed tellerium off the black market. Neelix heads out, some soldiers pick up Tuvok and B'Elanna and a nice little dude helps Janeway get away, though she's injured. She wakes up in his house and most of the rest of the episode is spent with Janeway trying understand her addled companion (who thinks she's his daughter) whilst forming a plan to free her officers from prison. I actually remember the first time I saw this one and it wasn't in the show's original run. I was in college and happened to catch it in reruns on Spike TV and even then it made an impression on me. I may have cried into my ice cream. I've always liked stuff about Bad Dads and especially Bad Dads and daughters. In fact, just before I saw this one, I had started on my most recent novel which prominently features a Bad Dad and daughter combination so this re-watch really resonated with me. I love that Janeway is out of her element in this one. She's stranded on an alien world she can't freely navigate and she's stuck with a person who is incapable of taking her orders because of his own mental state. Additionally, when Caylem identifies Janeway as his daughter, and she feels she must go along with it, we see a more tender side of her. This gentility is thrown into contrast when she ends up doing the ole' honey pot gag to get into the prison. While I sometimes balk and this plot move, I don't mind it too much here. It makes story sense and keeps with the whole Don Quixote feeling of the episode. Mulgrew and Gray are lovely together and their read of the subtle script makes this one a powerful (if painful) experience. Whenever this one comes on, I always sort of dread being put through Caylem's hardship all over again but, unlike a few wonky episodes (mostly involving the Kazon) I never change it or skip it or turn it off. 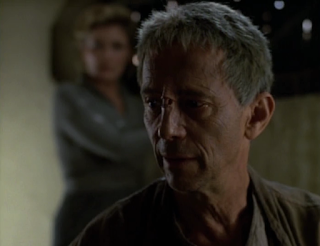 I just watch these two fantastic actors carry out one of Voyager's first truly great episodes.